1. PAN: Except government departments, all proprietor and legal entities are mandatorily required to quote their Permanent Account Number (PAN).Persons having temporary registration i.e. (without PAN) shall have to obtain PAN and apply online for PAN based registration within 31st May’2015. 2. Email address and mobile number are mandatorily required to be quoted by the applicants in the application form. Existing registrants are required to file an amendment application by 30th April’2015 for providing the said details. 3.Trust Based Registration shall be granted within 2 days of filing of completed online application (in‘Form ST–1’), through web-portal ACES (www.aces.gov.in). Registration certificate downloaded from the ACES website would be accepted as proof of registration. 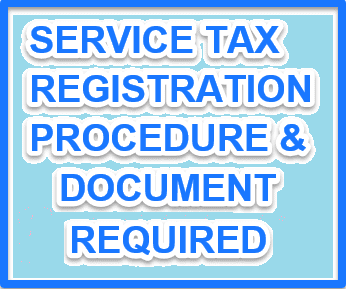 The applicant on obtaining such registration shall be able to pay service tax electronically. 4. Verification of Premises shall be done in case need arises and it shall have to be authorized by an officer not below the rank of Additional/Joint Commissioner. c. the documents are found to be incomplete or incorrect in any respect. a. Copy of PAN card of the proprietor or legal entity registered. b. Photograph of the person filing the application. c. Proof of identity of the person filing the application(Such as PAN, Voter ID Card, Passport, Aadhar Card, Driving License or any other Photo ID Card issued by CG, SG or PSU). e. Details of the Main Bank Account. f. Memorandum/ Articles of Association. h. Authorization by the Board of Directors/Partners/ Proprietor for the person filing the application. i. Business Transaction Numbers obtained from other Government departments or agencies such as Customs Registration No. (BIN No), Import Export Code (IEC) number, State Sales Tax Number (VAT), Central Sales Tax Number, Company Index Number (CIN) issued prior to the filing of service tax registration application. Relevant Order has been reproduced hereunder. The legal provisions for registration in service tax are contained in section 69 of the Finance Act, 1994, rule 4 of the Service Tax Rules, 1994 and the Service Tax (Registration of Special Category of Persons) Rules, 2005. Paragraph 2 of Circular 97/8/2007-Service Tax dated 23-8-2007 and Order No. 2/2011-Service Tax dated 13-12-2011 also explain some of the procedural aspects of registration in service tax. In supersession of Order No. 2/2011-Service Tax dated 13-12-2011, the Central Board of Excise and Customs specifies the following documentation, time limits and procedure with respect to filing of registration applications for single premises, which shall come into effect from 1-3-2015. (i) Applicants seeking registration for a single premises in service tax shall file the application online in the Automation of Central Excise and Service Tax (ACES) website www.aces.gov.in in Form ST-1. (ii) Registration shall mandatorily require that the Permanent Account Number (PAN) of the proprietor or the legal entity being registered be quoted in the application with the exception of Government Departments for whom this requirement shall be non-mandatory. Applicants, who are not Government Departments shall not be granted registration in the absence of PAN. Existing registrants, except Government departments not having PAN shall obtain PAN and apply online for conversion of temporary registration to PAN based registration within three months of this order coming into effect, failing which the temporary registration shall be cancelled after giving the assessee an opportunity to represent against the proposed cancellation and taking into consideration the reply received, if any. (iii) E-mail and mobile number mandatory: The applicant shall quote the email address and mobile number in the requisite column of the application form for communication with the department. Existing registrants who have not submitted this information are required to file an amendment application by 30-4-2015. (iv) Once the completed application form is filed in ACES, registration would be granted online within 2 days, thus initiating trust-based registration. On grant of registration, the applicant would also be enabled to electronically pay service tax. (v) Further, the applicant would not need a signed copy of the Registration Certificate as proof of registration. Registration Certificate downloaded from the ACES web site would be accepted as proof of registration dispensing with the need for a signed copy. Photograph and proof of identity of the person filing the application namely PAN card, Passport, Voter Identity card, Aadhar Card, Driving license, or any other Photo-identity card issued by the Central Government, State Government or Public Sector Undertaking. Document to establish possession of the premises to be registered such as proof of ownership, lease or rent agreement, allotment letter from Government, No Objection Certificate from the legal owner. Details of the main Bank Account. Memorandum/Articles of Association/List of Directors. Authorisation by the Board of Directors/Partners/Proprietor for the person filing the application. Business transaction numbers obtained from other Government departments or agencies such as Customs Registration No. (BIN No), Import Export Code (IEC) number, State Sales Tax Number (VAT), Central Sales Tax Number, Company Index Number (CIN) which have been issued prior to the filing of the service tax registration application. 4. Where the need for the verification of premises arises, the same will have to be authorised by an officer not below the rank of Additional /Joint Commissioner. (i) the premises are found to be non existent or not in possession of the assessee. (ii) no documents are received within 15 days of the date of filing the registration application. (iii) the documents are found to be incomplete or incorrect in any respect. 6. The provisions of sub-rules (5A) and (6) of rule 4 of the Service Tax Rules, 1994 may be referred to regarding change in any information or details furnished by an assessee and transfer of business to another person, respectively. Similarly, sub rule (7) of the Service Tax Rules, 1994 may be referred to in case a registered person ceases to provide the service for which he has been granted registration. 7. Paragraph 2.0 of Circular 97/8/2007-Service Tax dated 23-8-2007 consisting of sub paragraphs 2.1 to 2.7 may be treated as withdrawn since there have been changes in the relevant legal provisions since the issuance of that Circular. The current legal provisions in the Service Tax Rules, 1994 and the Service Tax (Registration of Special Category of Persons) Rules, 2005 may also be referred to.